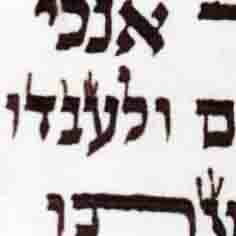 "My understanding is that the words "aish-das" at the beginning of V'zos HaB'racha are supposed to be written as one word as per the ksiv of the Mesorah. If they are written as two separate words, is the sefer Toah passul?" My instinctive answer, based on hilchot kriat hatorah, is that a new sefer is not required for kriah purposes, but that the error should be corrected as soon as possible. I was not able to find a mekor that brings this shaila specifically. R' Moshe or R' Eli, do you know of any? In all tikunim אשדת is one word, so therefore it should have the law of a hefsek in the middle of a word, that a new sefer should be taken out. But, see Shaar efraim ch. 2:8,17, and the Shaar efraim end of ch.3 mentions אשדת as a 1 word that should be written in one line, and if written in 2 lines is pasul, and a new sefer taken out. Meir einei sofrim 14:5,30 that אשדת written in 1 line with a hefsek should be fixed, but bdieved it can be used till a sofer can fix it. This issue still needs clarification, since he mentions קצת ריוח - maybe if it is a regular hefsek as between 2 other words the law is more l'chumra? 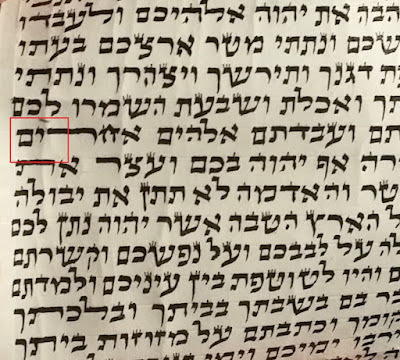 in the 2nd chelek of the keses (printed in the back of sefer mishnat hasofer) he explains in the "lishkah" how if this word was written like 2 words it is pasul. Thanks R Moshe and Heshy for the references. I thought that the law of hefsek in a word pertains to a word that is 1 complete word, whereas אש דת is read as 2 separate words and only according to mesorah it's written together. Since even when written separated the meaning and the sound is the same, I wouldn't have thought a new sefer is needed. This may explain why Shaarei Efraim seems to only be saying it's pasul if it's written in 2 lines, but not if it's on 1 line even if separated. 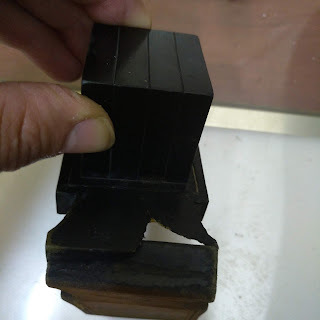 Perhaps it needs to be very removed from the mesorah before a new sefer is required. From my understanding Meir Einei Sofrim is saying 2 things. Firstly, if it's written on 1 line but separated (ie at a distance of normal word to word separation) then it must be fixed. Secondly, some sofrim lechatchilah leave a small space (קצת ריוח) between the words, which seems fine. It seems that lishkat hasofer initially paskened אשדת to be kosher if it's written as 2 words but only if it's in the same line. He then seems to retract that at the end, as Heshy said, to hold that it's pasul in any case. 1) All agree that if אשדת is written on 2 separate lines that it is pasul and requires a new sefer. 2) There are those that say אשדת written separately on 1 line is kosher, and there are those that say it's pasul. Therefore I would say it needs to be fixed but a new sefer is not needed in the middle of keria. Heshy thanks for the reference to the lishkat hasofer. Ari, I agree to your answer.